A quick glance at the brief history of Desert Oasis’ boys tennis program makes the team’s improvement easy to see. The Diamondbacks finished fourth in their league three years ago, third each of the last two years, and second in the Northwest League this season. 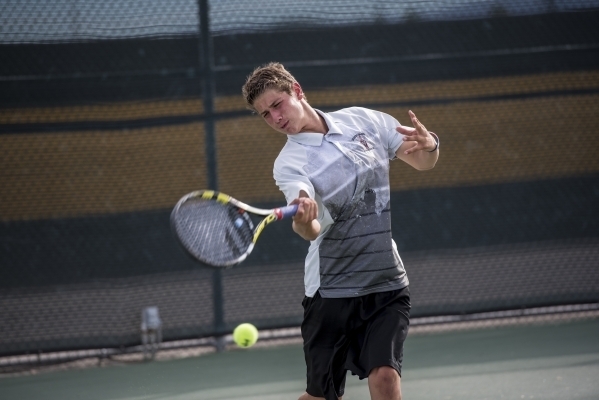 A quick glance at the brief history of Desert Oasis’ boys tennis program makes the team’s improvement easy to see. The Diamondbacks finished fourth in their league three years ago, third each of the last two years, and second in the Northwest League this season. But a look around the courts during practice or a match shows the reason why. The Diamondbacks (6-2) aren’t just winning and improving. They’re having fun while building one of the better programs in the Sunset Region. And for the first time in the school’s history, they’ll host a postseason tennis match when they entertain Shadow Ridge (2-6) in a Sunset quarterfinal at 3 p.m. Tuesday. The Diamondbacks have only 11 players, but have become a close-knit group, adding to the team’s success. “Our team this year is very close,” said junior Ben Gajardo. “It’s more like a family this year, and we look out for each other. We feed off each other’s energy. Gajardo gave the program a big boost last season when he won the Division I state singles title. The previous four large-school state singles titles were won by players from traditional powers Clark, Palo Verde and Bishop Gorman. The Diamondbacks may not be an underdog for much longer. The team came within two points of winning a league title this season, falling to Centennial, 10-8 in the teams’ second meeting. Centennial is the only team to defeat Desert Oasis this year. The Diamondbacks have never won a postseason match, something they hope will change on Tuesday. The Sunset, Sunrise and Division I-A Southern Region boys quarterfinals all are Tuesday at host sites. Girls quarterfinals in the three regions begin at 3 p.m. today at host sites. Region finals are Friday at Darling Tennis Center.